I would like to begin by thanking you for organizing this high level meeting to discuss one of the most defining issues of our era: climate change and its impacts on humanity. I look forward sharing with esteemed delegates tody, the current challenges and impacts of climate change in Afghanistan, and the measures we have taken to address them. As a least developed country, Afghanistan is severly affected by climate change, while our contribution to global greenhouse gas emissions is low and very minimal. Unfortuntely, in regards to affects of climate change, Afghanistan’s geographical location and topography makes the country highly vulnerable to adverse risks such as heat waves, drought, and extreme precipitation events. Further, socio-economic factors such as widespread poverty, poor adaptive capacity, low levels of development, as well as insecurity, contribute to the challenge even more. The Government of Afghanistan and the Afghan people are well aware of the challenges posed by climate change, which has emerged as an actual threat. According to the recent report published by the National Environmental Protection Agency, long-term climate models project a decrease in precipitation by 32% in the northern part of Afghanistan. Our river basins are among the most stressed in Asia, due to shrinking glacier cover, and rapid decrease in rainfall. Water security remains a major challenge for us, as parts of Afghanistan becomes hotter and drier. In 2018, rainfall in the northern provinces of Afghanistan was 70% below the long-term average, with severe implications for an estimated 1.4 million people dependent on wheat and sheep farming. Last year a devastating drought affected more than two-thirds of the country, directly impacting 4 million people across the worst affected provinces. Additionally, flash flooding in several provinces have caused significant loss of lives and property. 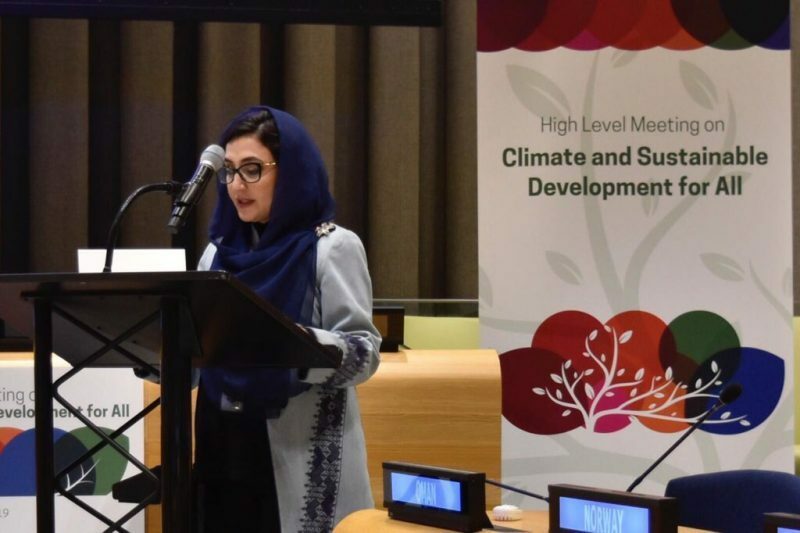 Over the past decade, the Government of Afghanistan, along with the National Environmental Protection Agency (NEPA,) have developed several measures to address this threat, which demonstrates our continued commitment towards climate action. The development of the National Adaptation Plan and the National Climate Change Strategy, outlines our strategic approaches to addressing mitigation and adaptation to climate change across all sectors. Some of our priorities include the development of improved agro-hydro-meteorological information and early warning systems, renewable energy and energy efficiency measures, and restoration and improvement of Afghanistan’s irrigation networks to improve agricultural production. We know it is important for us to formulate a coherent and well-coordinated country programme that would highlight these major priorities for long-term investment into climate resilience. However, Afghanistan currently faces significant challenges in accessing climate finance, which we desperately need, in order to build a more resilient society as well as remaining on track to achieve our climate goals. As an LDC, we have limited scope for securing concessional financing, equity and guarantees. We have had only two developed GCF projects of around 83 million USD. We do not have an accredited National Implementing Entity and currently, there is limited capacity within Afghanistan to meet our NDC goals. We need better data to develop robust and evidence based policies on climate change, along with inter-instituional coordination efforts, for cost effective actions at national, provincial, and local levels. However, if these are our challenges, the LDCs also provide opportunities in terms of learning what had not worked-out in development countries to reduce the challenges of climate changes & instead implement the lessesons learned in coutnries like Afghanistan where infrastructures are basic, and we can use today’s new technology and methods to build the new infrastructure environmental friendly, and take necessary measures accordingly. The Government of Afghanistan recognizes the global scope of the problem, and believes that effective climate action depends on joint action and alignment of goals and objectives at a braoder scale. We look forward to enhanced support from our development partners on climate-responsive budgeting to support mainstreaming of mitigation and adaptation approaches into development initiatives. Following through our commitments, creating synergies with the 2030 Agenda, and providing special support to the most vulnerable, are our main proiritities. My delegation fully supports this multilateral platform, with UNFCCC as the foundation, to fulfill the implementation of the Paris Agreement. We look forward to participating in the 2019 Climate Summit in September to continue our collaborative work on climate action.